1. Jo Boaler challenges her online students to "design an activity that will reposition mistakes at school or in homes". What might you do to create an atmosphere that encourages and values mistakes in your classroom and/or beyond it? 2. Boaler says that in order for students to make mistakes, we need to create "disequilibrium" and give them work that is difficult for them. "This will be a big change for many teachers who currently plan the tasks....to ensure student success". As a teacher of SK/1, I sometimes struggle to find that "zone of proximal development" since many of my students are just learning to work independently- I can't always physically get around to support everyone, and if tasks are too hard, the kids get frustrated and lose interest. Comments? 1. When we're working on Math in my class, and we come back to share as a group, I will often choose a student, who is stuck with certain misconceptions, to share. We will talk about their work, and will work through it together. Then I'll ask if their thinking has changed (never using words like now it's right and before it was wrong) and ask them to explain how their thinking has changed, and then I tell them their brain just grew. And near the end of this year, we started using the gesture for "mind blown!" And we all cheer. And I'm always careful to ensure that we, as a class, thank the child for sharing with us, and helping us all learn. I think when you approach mistakes as something that is valued and becomes an opportunity for growth (for them and others), I think the kids will be more willing to take risks. Even though I centre the kids out (and by asking ahead of time I can often convince them to share by letting them know we have a lot to learn from their work today or let them pass) but our sharing of their work is always done with respect and in such a way that their sharing is valued by all. For several years now, I have often used a visual (a set of pictures) of a brain, hand, eye, ear, mouth, and have often talked to the kids about how we can make our brains stronger by using lots of pathways ( my kids this year equated it to a spider web!) When exploring numbers, for example, we are strengthening the pathways by seeing it, hearing it, saying it and touching it. After reading this book, I will add this whole notion about challenging ourselves and making mistakes adds more pathways, which also makes our brain stronger. Marnie, I think this is really important. My 10 year old daughter sometimes struggles with math and a poor math mindset and I tell her over and over that the brain is programmed to learn and that anyone can learn math, it's all about hard work and perseverance. I am going to remind her of the brain and how it looks/works in September when she begins a fresh year with a new teacher. It's never too late to learn math! My goal as a teacher is to create an environment where children feel safe to take risks. We often talk about the importance of making mistakes and I try to frequently model mistake making. "Mistakes are encouraged and celebrated" is one of my classroom philosophies. I love Boaler's activity with the crumpled paper and am definitely going to try this in September. We have always done classroom cheers (e.g. seal of approval, round of applause) for a job well done. I would like to include these fun cheers when we have all had an opportunity to learn from a mistake. Peeking back at chapter one (sorry I am late joining this conversation and new to this forum for learning),Jo Boaler's piece about praise is a good reminder about the importance of the language we select when offering feedback to students. I have always tried to give specific feedback to my children, but have definitely done more after reading this chapter. I have been driving them crazy lately. When they ask, "Did I do a good job on this picture, Mommy?" I often reply with, "I see you have used many bright colours or I can tell you spent a lot of time on this project". I wonder if now that we are part of Growing Success if more teachers will notice and name the learning and provide rich descriptive oral feedback for improvement instead of the empty praise many of us default to. It definitely takes time and practice to learn to not give that praise and instead constructively comment on the effort and work behind what a child has done. We read many books about mistakes and trying to overcome difficult situations including "Beautiful Oops", "Ish", and "It's Okay to Make Mistakes". We have a lot of whole group conversations about why making mistakes helps our brain grow (I like to show them the pictures in Boaler's books) and we learn the names of the parts of the brain and how learning happens. I often make a lot of accidental mistakes (I'm forever writing the wrong date on our morning messages, mixing up instructions, etc.) and I use these as very real, teachable moments to discuss how even adults make mistakes. When we try something at the science or art centre and it just doesn't work out, we celebrate the mistake and try again. I think this creates an environment where we celebrate mistakes as learning opportunities and tell ourselves over and over that it's okay because we can try again. Hi Deanna, you might also like books from the Great Idea Series. My librarian had several of them. Look up the title In The Bag: Margaret Knight Wraps it Up. It's my favourite. Each title is about an early inventor who shows perseverance. They are a bit long but my kids really liked them. I used them as an opportunity to talk about challenging projects and our approach when faced with a difficult task. Ask any of my kids what our class motto is and they will tell you it's, "we never give up!" 1. We too read a lot of books about how it's okay to make mistakes, and we talk about how making mistakes helps our learning. I am always making mistakes and the students love correcting me - I often say "even teachers can make mistakes". 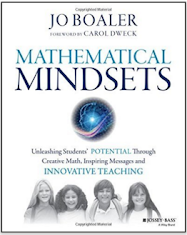 I love the idea of showing them the pictures of the brain that Boaler has in the book and explaining what they mean. I really like the idea of the pathways using pictures. Definitely going to incorporate some of these strategies into my classroom next year. 2. During my college years (I have my ECE diploma) and my undergrad (I studied Child Studies, which focused heavily on psychology), I learned a lot about the zone of proximal development. I too, find it difficult to get around to all of the students in my class (I teach a JK/SK split, and alternate classes - 50/50 french immersion). This year I tried to work more one on one with small groups of students, especially focusing on the SK students, but my program still needs work and tweaking to get it to where I want it to be. I find this the hardest part of my job, and it's constantly needing to be tweaked and re-worked, depending on the group of students and their needs. I also love the idea of showing the pictures of the brain, and talking about what happens there when you make mistakes and try different solutions. This year I used the MindsUp program to do some mindfulness with my class and they LOVED the initial discussions about the different parts of the brain, and even near the end of the year they were using the words amygdala, and hypocampus to explain what was happening. I used to love my colleague's poster that said "This class is the safest place to make mistakes", but now I'm thinking we need to make sure we build the kids' comfort level with making mistakes everywhere, and not just in the classroom. It is sort of like resilience training for the real world. If you can make a mistake and not let it get you down, but build on it, its an amazing life skill. So true, Vicky! We always want students to feel safe in the classroom, be it making mistakes or safe from other things (bullying, discrimination, etc). But students need to know that mistakes can be made anywhere, and that's okay too. Too often I see parents making accommodations for their children so things are "easier", and then I see the struggle those students experience because they don't know how to deal with things when they don't work out. I think it's important to show & share your own thinking, and show the mistakes you make... so, in a sample problem, say, "at first, I thought... and then I realized this...". Then, you can point out how important it is for everyone to keep an open mind, and value the mistakes, because they are the things that help us learn. Celebrate mistakes when they happen. In the early years, you can "accidentally" mix paint colours together and see what happens! Sometimes beautiful things come out of an oops. And there are some great books that deal with this!! Once kids see mistakes as a learning tool, then over time they will begin to change how they view them! Also, I think it's essential to get parents informed and on board about making mistakes - in order to create kids who are willing to take risks, they need to feel good about making mistakes. Giving parents tools to use at home can only help to reinforce the messages at home! In response to how to create disequilibrium, that's tricky for sure... perhaps coming to terms with the fact that you won't get to everyone everyday is something we as educators have to accept. Maybe we can ensure we get some 1-on-1 time with each child once per week? Even schedule it so you are sure?!? I try to aim for 1:1 time with each child per week and it is tricky sometimes depending on how our day is going. I strive for it though along with small group times as well. It's funny how children seem to naturally gravitate to one of the two educators. Even when one of you is engaging, playing or problem-solving with the class while the other educator is working with a child or a small group, there are certain kids who will choose to wait for a specific educator instead of solving or sharing with the one who is available. I make mistakes in our daily morning message and when the children point it out (and they always do!) I take the opportunity to share that it's ok to make mistakes and that I make them all the time. I also like to read the Todd Parr book: It's ok to make mistakes. I really like the idea that Boaler mentioned re: putting up everyone's answers, even the mistakes and discussing the thinking behind them. This would be especially useful in the upper grades. I've found with math, using problem solving questions helps to create that disequilibrium amongst students. I'm looking forward to getting some new ideas in the next few chapters. Mistakes are excellent learning moments. When doing number talks the kids at first would get upset if I forgot to put the answer in to the equation. Slowly they learned that I was more interested in the thoughts processes to get the answer. Creating an environment when kids feel free to make mistakes takes time. I worked the last 3 years with grade 3's. This year I taught grade one and quickly realized I needed to model the importance of mistakes. Kids would quickly pipe in "that's wrong". They began to get use to me replying with let's hear his thinking. Most times the students caught their mistake as the said what they did. Creating a safe environment for mistakes I find more challenging with the younger students. I love discussing feedback and the way in which we speak to children. I find with work education teachers, student teachers, administration... Often they speak down to the kinders and praise them right away. I often find I reminding others that they are capable as long as we treat them as such. I agree with you Kailey, it is frustrating for children to adjust to the constructive feedback when all they have known is praise. I feel this is something that I am always working on. Thank you for sharing! 1. Really stressing from day 1 that mistakes are our way of learning. If we can get this ingrained in students minds during there Kinder years I feel our students academic careers will take a turn fr the better. They ill be more willing to participate even when unsure and we wont have as many older students who are "tuned out" due to thinking they are not "smart enough". Some ways we can promote this mindset are group chats, modelling (heck I make spelling mistakes all the time-but I learn from them) and some age appropriate books. 2. I agree with students starting to lose interest if something is too challenging. This goes back to the answer to question 1: fostering a growth mindset will enable them to approach more challenging tasks with an open mind. 1. Like others have said, create a classroom where mistakes are valued and celebrated and out rightly state why they are valued (our brains are growing!). I loved the example she gives of the classroom in Japan where the teacher only calls on those who have made mistakes to share their work. 2. I think if you foster this kind of environment - the "let's try and it's okay if we fail" kind of environment - you will have far less frustration than in a traditional classroom that is looking for right answers.